With hundreds of products on the market and when you’re new to the sport, finding the right equipment can be totally overwhelming. On top of that, it is all too often that we see beginners buy the wrong board for their skill level. In this video, we’re going to run through the best equipment to support your learning, and make surfing more enjoyable. As a beginner, do not go out and buy a shortboard, or the “coolest” looking board you can find. To be completely honest, I started out on a Wavestorm. I recommend getting a soft top longboard to help you pop up easily, and maintain balance. Okay, this is a beginner surfboard, and this is one of my favorite boards, now as you can see this is a nice soft surfboard compared to your fiberglass boards and that’s something you’ll move to in maybe a more intermediate stage. To look for a good quality soft board you want to find something that has lots of foam around the rails and also the nose of the board, and that’s really just to absorb any force that may occur if the board hits you or someone in the water when you’re learning. I’m just going to run through the parts of the boards; in case I refer to that later, then you’re going to know what I’m talking about. So down here we have the rails, at the front is what we call the nose, down the back is the tail, on here this is the deck, and this is wh-at we’re going to stand on, through the middle is the stringer, and this is going to help with our feet placement later. We’ve got our fin plugs here at the bottom, that’s the bottom of the board, and that’s nice and plastic, and then we’ve got our nice plastic fins as well. Now when you’re looking for a good quality soft board, you want to look for something that has the right length and also buoyancy for your weight and your height, and finally don’t forget this is our leg rope it goes on our back foot, I’m a natural footer which means my leg rope goes on the right foot. It doesn’t matter which foot you have in front or behind, and it’s just whatever feels comfortable for you, we’re going to get Candice to help us find our back foot. I’m going to give Candice a little push and as she steps forward the foot that comes forward is going to be her front foot, and the foot that stays planted at the back is going to be her back foot, so here we go, awesome. Okay so Candice step forward with her right foot, and that means she’s a goofy footer, her leg rope is going to go on the back foot which is her left foot. Now when you’re putting it on make sure you keep your stringer pointing out to the side, and that way you’re not going to trip over it when you’re walking. When it comes to wetsuits and bikinis, you really want to look for something that’s both functional and fashionable, if you’re surfing in cold water you want to look for a steamer suit which has got long arms and long legs, if you’re surfing in warm water you want to look for something that’s going to protect you from the sun, that makes you feel supported and it also makes you feel great. So really you just want to find something that works for you, again you can check out our site for all our favorite brands and products, thanks for your help, Candice. So just finally this little guy’s our wax, he’s going to help you grip to the deck of your board, so you’re going to apply the wax in a circular motion to the areas where your chest and your feet land on your board. Wax comes in a variety of different formulas to suit different water temperatures, so just ask your surf shop what is best for your local conditions. To apply, I’d highly recommend hiring a board before you go on buy one, that way you can get a feel for what feels good for you. I suggest selecting a board that fits under your arm or with one hand to keep it in place. When walking into the surf ensure the nose of the board faces directly into the oncoming wave, lift the nose up over the approaching whitewater and jump over the wave at the same time, never allow your board to become between you and an oncoming wave otherwise it could flick up and hit you. So that’s our equipment section, I hope you found it helpful if you do have any additional questions, please post a comment below! ​WHAT TO LOOK FOR IN A SURFBOARD? what’s there to think about? You just hit the keyword in Google search or go to the nearest surf store and pick the one you like the most. Sure, that would work in a movie maybe, but in the real world, things are different. You cannot and should not buy the first surfboard you see or decide to make a purchase without taking some factors into consideration. Remember, as a be-ginner your surfing skills will improve only when you get proper equipment. Without adequate surfboard, you won’t be able to learn at your own pace or make gradual progress. when buying your beginner surfboard you need to consider the type of rocker which can be continuous, nose, flat, and tail. Increased or higher nose rocker is usually characteristic for boards that are created for bigger or more hollow waves. This type of rocker enables a shape that won’t just plunge right into a steep, large wave. On the flip side, flatter rocker allows the surfboard to plane faster, but it decreases maneuverability while increasing the likelihood of pearling as you take off. Tail rockers are found in surf-boards that are specifically created to provide optimal maneuverability. refers to the amount of space a surfboard occupies. Now, before you start thinking this is not a math class or that all this is way too technical for a video of this kind hear me out first; too little volume won’t allow you to catch many waves and you’ll find it difficult to generate speed due to increased resistance. marks the distance between the nose and tail. Surfboard length is one of the most important factors to consider when buying equipment, particularly if you’re a be-ginner. The reason is simple; length is absolutely vital for your progression. In fact, many beginners make a mistake by buying a board that is too short for them. as a beginner you’re just learning how things work and are trying to get more experience in order to develop surfing skills. Expect to hit a thing or two with your board, you may even fall on it, and stuff like that. Let’s be honest, and you don’t want to end up buying a new surfboard every month. I know, I know, not everything’s about money, but it’s still an important factor to consider. You’ll probably come across very cheap surfboards, and it’s natural to want to buy them immediately. We all love getting nice stuff without spending too much money. However, if the board seems too good to be true, then it probably is. Chances are there’s something wrong with the board that seems like a great buy but comes at a very very low price. Determine the budget you’re willing to spend on the surfboard and look for equipment within that price range. Remember, expensive boards, aren’t necessarily bet-ter. although this is not something we usually think about, refund policy speaks a lot about the brand and the way it works. If you’re not able to get a re-fund for a product that you don’t like or find unusable, then you’re definitely considering the wrong board. ​I mentioned various factors worth considering when you’re looking for the beginner surfboard, but come on let’s be honest, it’s easy to forget about those things. I’ve been there myself. Don’t even know how many times I have decided to buy my first surfboard back in time only to realize I really didn’t know what to look for, although I had read different buying tips earlier. Soft topsWhen you’re in the store looking for surfboards, take out the list and check each item. Go for the board that meets all or a vast majority of the criteria. This makes surfboard shopping easier and more fun. ​I’ve seen beginners buying short boards all too many times. Okay, it probably seems more logi-cal that one should start with shorter boards because they appear easier to use and navigate. Reality is entirely different. Shorter boards can make it difficult for you to take your surfing skills to a whole new level, in fact, that type of board is probably holding you back. ​The most frustrating thing in all this is that even some shop assistants recommend their cus-tomers to start with a mini mal board. Why they always insist on these boards is beyond me, but it could explain why beginner surfers tend to repeat this mistake over and over again. As a beginner, you trust that a shop assistant who works with this type of equipment knows best and you follow their advice. As an adult who wants to improve surfing skills and get the maximum out of this whole experience, you need to go for longboards because they allow you to catch more waves and obtain other benefits that I mentioned earlier. Shortboards may look cool and are easier to carry underarm (although longboards aren’t un-practical either), but when you’re in the water and can’t catch a wave to save your life, you’ll figure out why going for a longboard was a better option after all. Since the whole purpose of this video is to show you the best surfboard for beginners let’s get it started, shall we? Board Company from South Bay of Los Angeles is a well-known name among surfers. They have a wide array of boards under their belt so it comes as no wonder why your beginner surfboard may be their Verve 8’. Basically, this is an 8-foot entry level foam surfboard for riders that weigh up to 200 lbs. This board is 3 inches thick and 23 inches wide and thanks to its soft top and great maneuverability, Verve 8’ can be considered the best surfboard to learn on or at least one of the most useful boards for beginners. The board is long-lasting and features a beginner-friendly nose and tail rocker. Verve comes with rounded out nose and tail shapes for additional stability and a great performance. The full-length double concave on the bottom deck is added for speed and fin performance. Users praise the ability of this longboard to catch waves without too much paddling effort. Also, the board falls into the right place on the wave which makes it more fun for everyone. 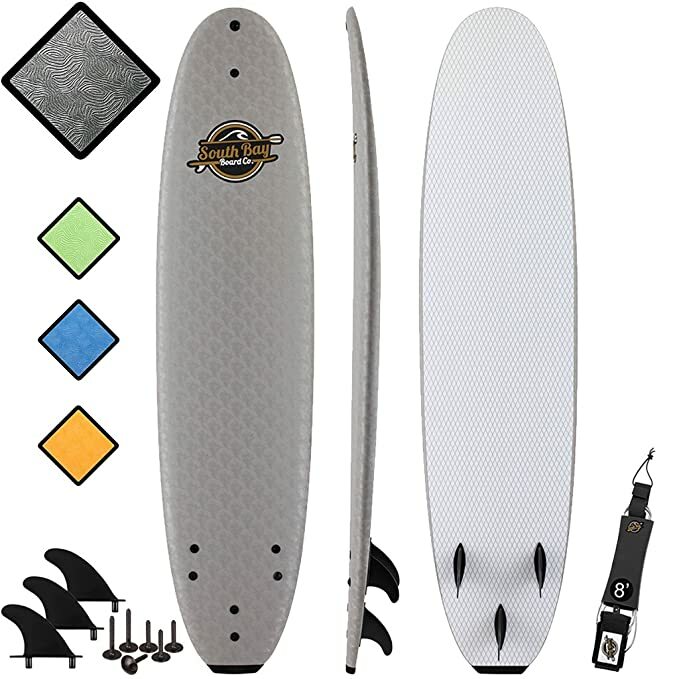 The purchase of Verve 8′ includes the longboard, the 9′ Rishu Surfboard leash, and a complete soft top surfboard screw-in fin set. It’s useful to mention that the board also comes with a 30-day money back guarantee. Wavestorm is the number one name in the surfboard industry. Founded in 2004, the company has achieved a major success with their boards, apparel, accessories, and basically everything else you need for surfing. If you’re looking for the best starter board, then Wavestorm 8’ is definitely worth considering. The 8ft classing longboard is one of the best-selling learn-to-surf models made by this company thanks to its lightweight design that is soft and easy to handle. What makes this starter surfboard so amazing is that the brand updates each season. They utilize the extensive manufacturing experience in order to improve performance, maneuverability, and other factors that are important for an optimal experience. The purchase also includes a removable ankle leash, fin set, and traction pad strong. The texture traction pad allows for stable foot placement. This beginner surfboard can support persons weighing up to 200 lbs. G-board from BIC comes in different sizes, but the ones that you’ll find most beneficial are long-boards with a soft top. What makes G-board an ideal beginner surfboard is the fact it features a full soft construction for maximum safety, comfort, and no stress surfing. This board has a good volume and stability that allow you to catch waves easily. G-board offers a reliable performance that allows you to experience an ongoing progression and improvement of your surfing skills. Similarly to other products made by BIC, the board is durable, i.e. it’s made to last. ​The board has safe, yet flexible fins, a laminated foam non-skid deck that is comfortable to pad-dle, stand up, you name it. The longboard supports persons weighing up to 165 lbs, but heavier persons (up to 175 lbs) have reported that the board supported their weight and it offered a great deal of flotation for someone their size. The best thing about this board is that it was spe-cifically created for beginners meaning it’s developed in such a way to provide the exact support and performance that surfing rookies need. Surftech is a surfboard manufacturing company founded in 1989 in Santa Cruz, California by a surfboard shaper Randy French. What French wanted to achieve is to witness an expansion in the industry of surfboards. More precisely, he wanted the industry to move from individually-shaped boards to efficiently manufacture mass production. This allowed surfers, beginners, in-termediates, and experienced alike to get a vaster election of surfboards at different prices. Their Learn2Surf is the ideal beginner surfboard for surfers weighing up to 220 lbs. The board comes with durable and rigid multi-stringer cores, heat-laminated soft foam decks, slick padded bottoms, and reinforced rubber bumpers at the nose and tail areas. The Learn2Surf board was specifically designed to withstand the most demanding conditions in order to give you your money’s worth. This board comes in different sizes, designs, but of course, longform board is the most practical. Even though it may not seem that way, but buying the beginner surfboard is a major decision. This is not something that you should try to go ASAP or get it over with. Purchasing the board requires thorough thinking, so you end up with the right product. ​->Take a few moments to think whether you’ll get your board from the surf shop or you’ll order it online. For many people, internet shopping is more convenient, and it’s easy to order the surfboard from the comfort of your home, but at the same time, you shouldn’t underestimate the importance of going to the store. I always recommend people to go to the store personally, find the board they like, and check for any surface imperfections or small dings that may have occurred during storage. Never settle for that when buying a new surfboard! New surfboards should be in mint condition, without imperfections and indentations. Always check them thoroughly before you end up paying for some-thing that is damaged. ​-> Try going for a cash deal. If you’re looking for a way to get a surfboard for less (and who isn’t), then you can consider going for a cash deal which is something that many private-ly-owned shops offer. -> Save up by trying to get decreased rates on surfing accessories like board bag, traction pad, and the leash. Some brands offer these accessories for free! ​Nowadays it’s easy to find surfboards with different designs which allow you to express your personality, passion, anything. When looking for a high-quality beginner surfboard to buy, make sure you also take design into consideration. Is it something that you like? Does it represent anything about? This is a great way to make surfing a part of your personality and lifestyle. Surfing is a wonderful hobby, a great physical activity, and an amazing opportunity to get closer to the environment, Mother Nature, and the deep blue ocean that surrounds us all. I fell in love with surfing years ago, and I’ll never stop loving it, but let me tell you something, learning to surf wasn’t the easiest thing in the world at first. With a little bit of persistence it’s easy to learn how to surf, but in order to get the maximum out of this activity, you need to find and buy the proper surfboard. In this video I showed you how to buy an ideal surfboard, listed examples to take into consideration, and now it’s just up to you to remember these recommendations and apply them to your situation. Good luck! If you have some suggestions or questions, feel free to write them in the comment section below.